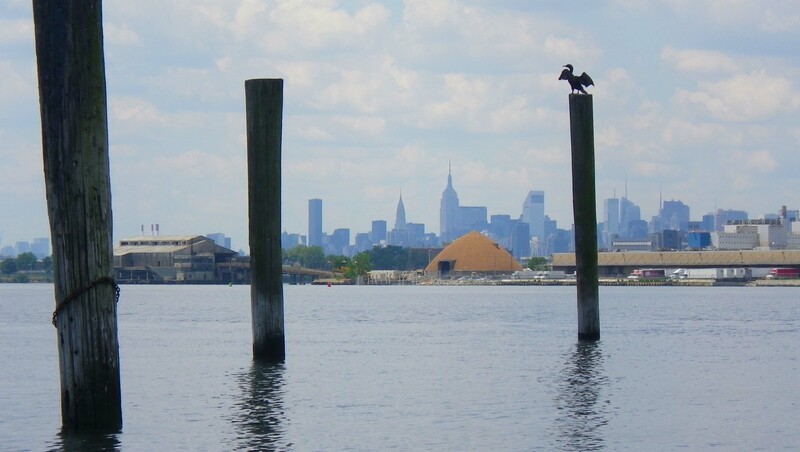 We approached the Bronx River as an extension of a Manhattan circumnavigation: From Pier 40 on the West Side of Manhattan, we paddled round the Battery and up the East River. 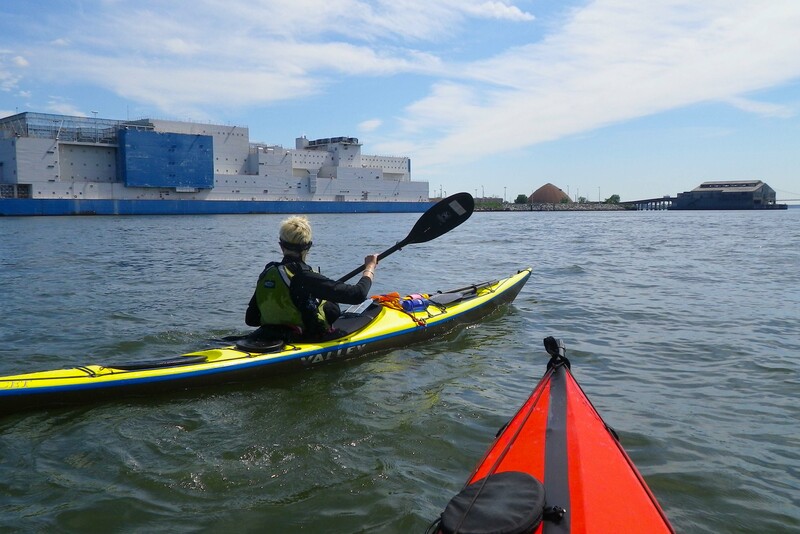 Then, instead of continuing on up the Harlem River, we turned right and paddled under the Hell Gate Bridge and out past the prison barge and the disused waste-transfer station opposite Rikers Island. We turned left at the waste-transfer station, and voila! 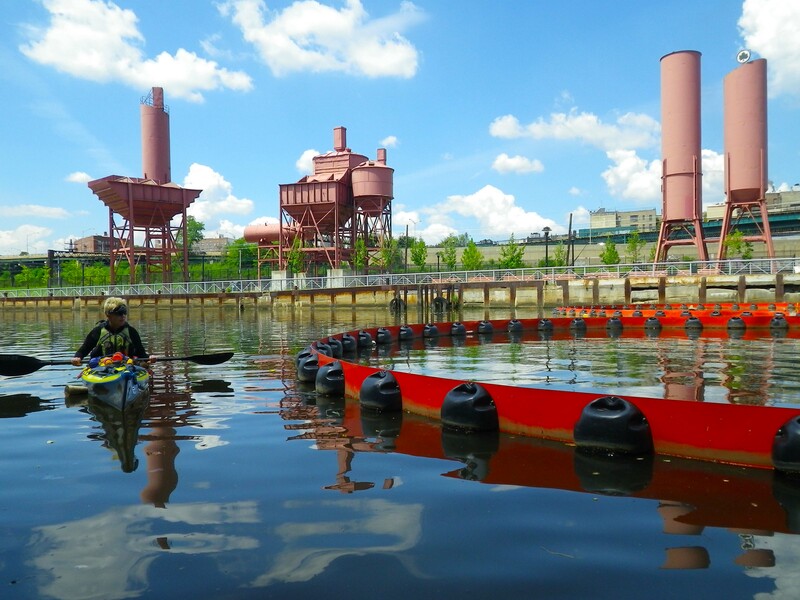 we were in the Bronx River. 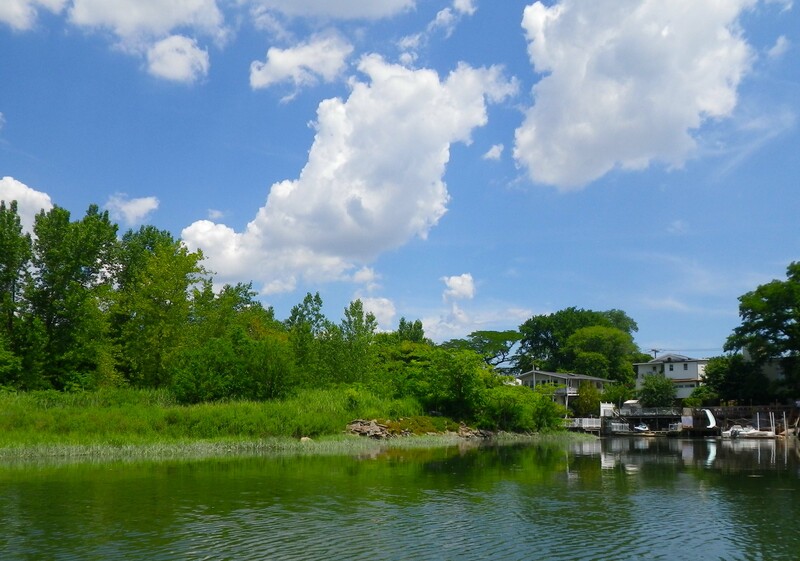 The mouth of the Bronx River was wide, green, idyllic. But this was the Bronx. 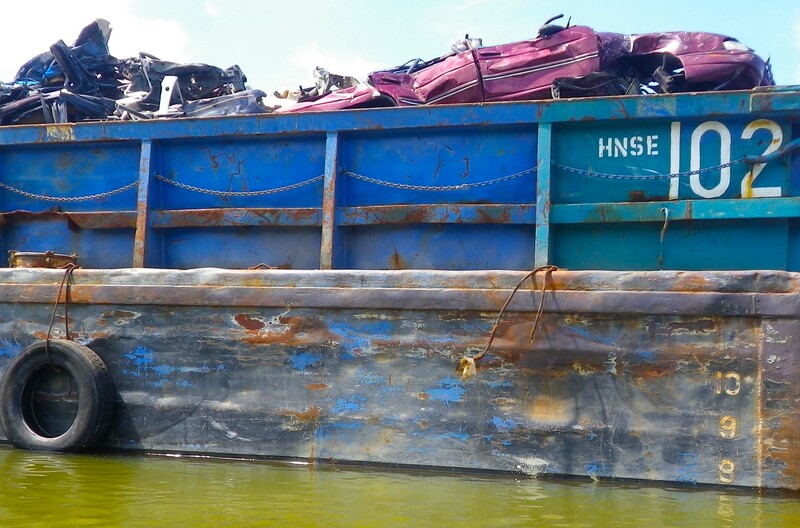 Soon we came to a vast scrap metal recycling facility. Still, on a beautiful day, against a blue sky, colorful industrial plant can be picture-postcard perfect. 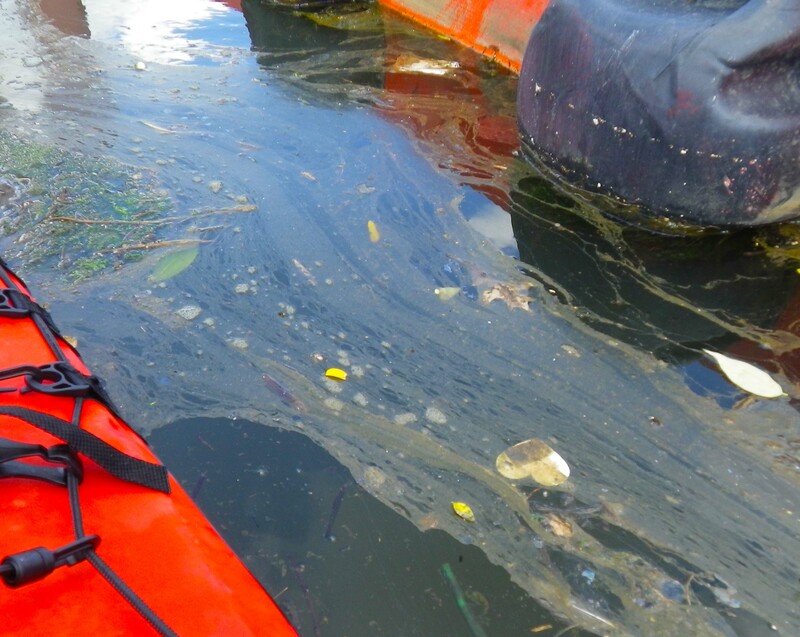 As we advanced further up the river, the water quality rapidly deteriorated. 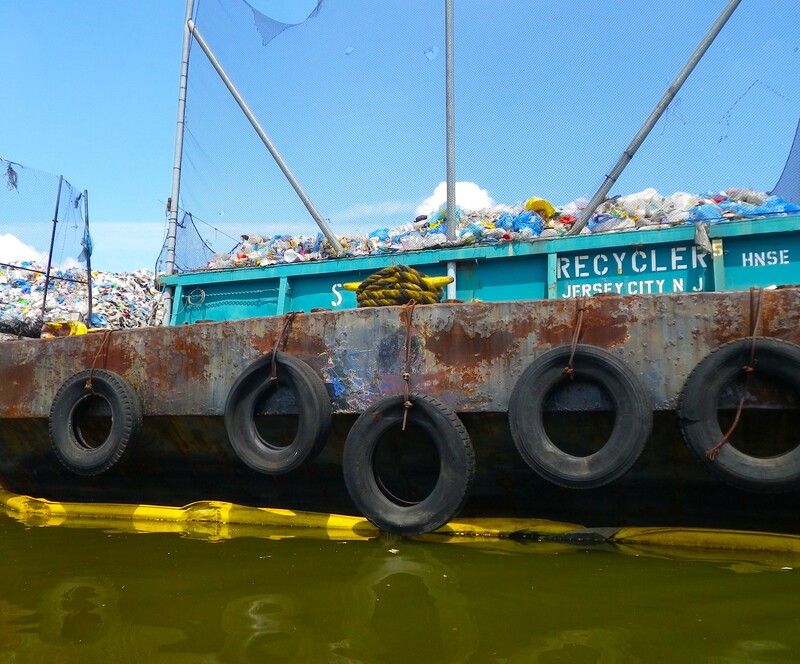 We encountered more and more floating plastic trash, and the water began to be covered with green scum. But there was still plenty of life in—and on—the river. We saw fish jumping, and several fishermen. 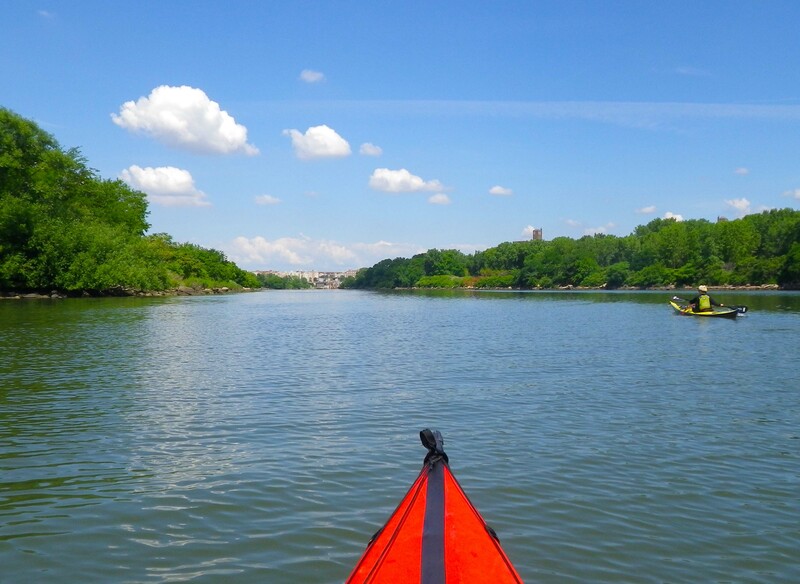 And we encountered a flotilla of green canoes, apparently introducing first-time paddlers to the beauties of the Bronx River. …But not for long. 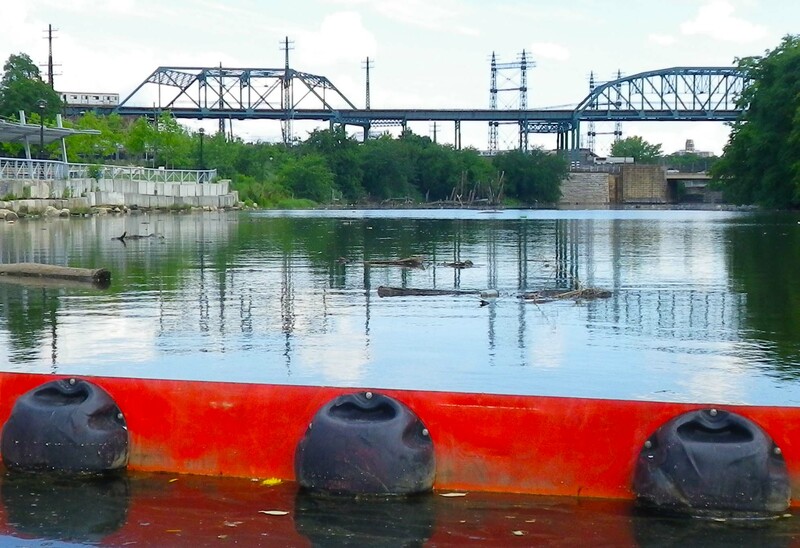 We saw in the distance a curious red line stretching across the river that soon resolved itself into a floating boom, set up to skim trash floating down the river. We should have known about it. It was there already in Bob Huszar’s photos. And it’s clearly visible even from space! But we don’t like to leave things unfinished. 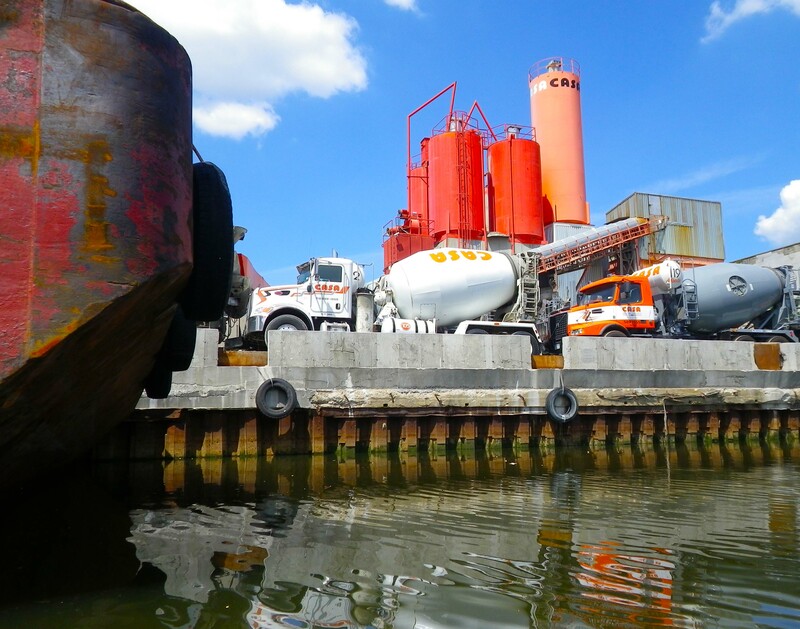 We and the Bronx River are not yet done. We’ll be back! All of Vlad’s photos from the day are here. 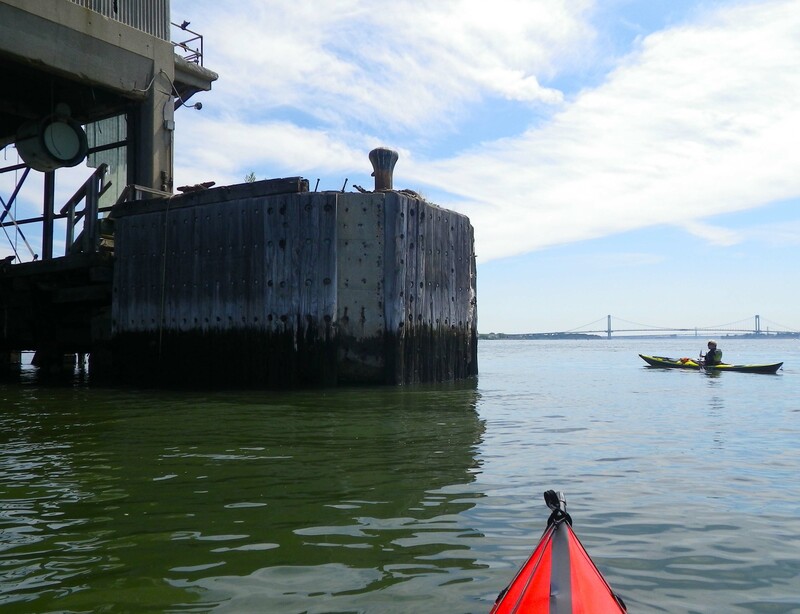 This entry was posted in Kayaking, New York City and tagged Bronx River, Kayaking, New York City, New York Harbor. Bookmark the permalink. Disgusting..what a shame how polluted the water is! 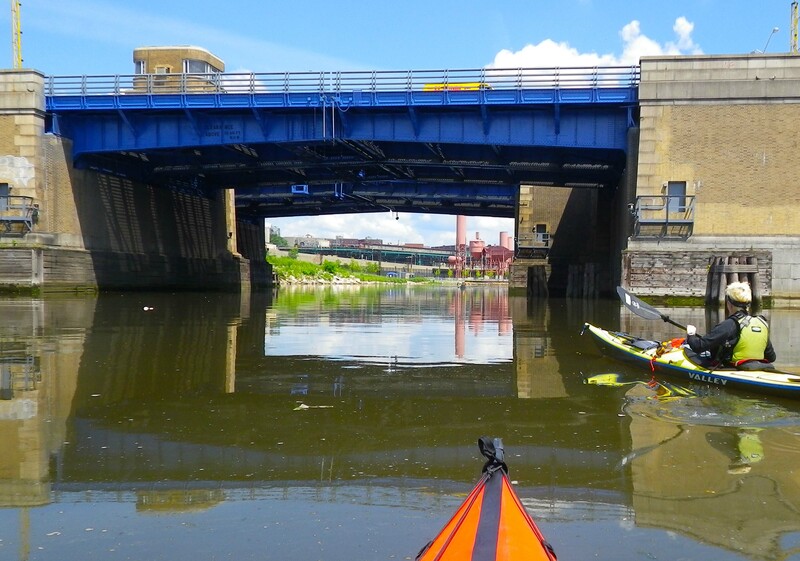 Actually, the Bronx River is by no means the worst. 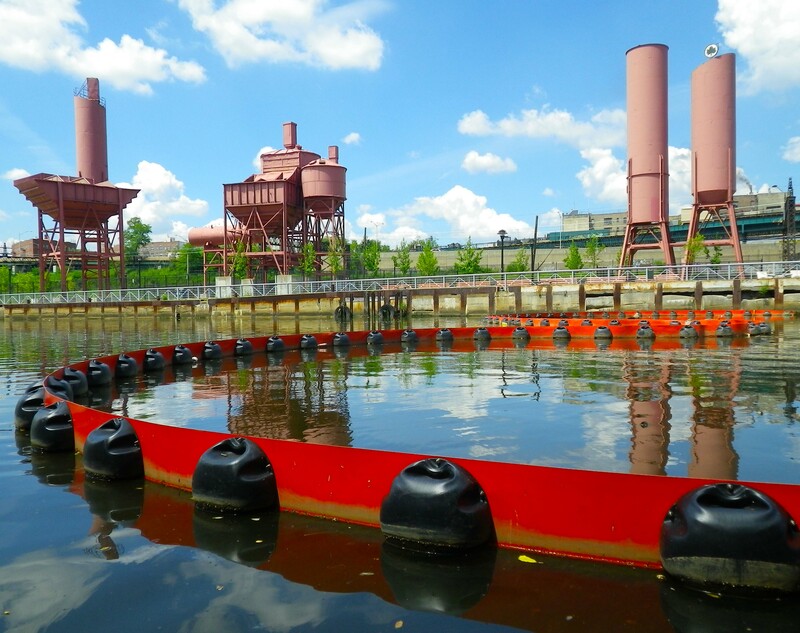 The Gowanus Canal is worse, as is Newtown Creek—both Superfund sites. It looks so beautiful from the train, but yikes the trash boom is unappealing to say the least. 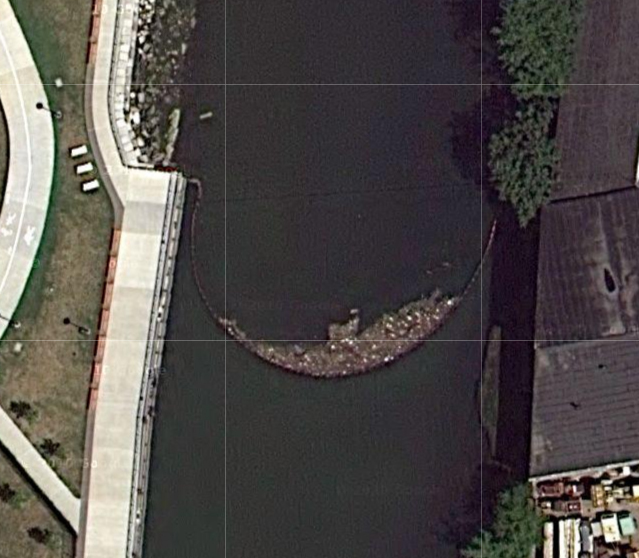 That makes the Charles River look pristine (and it isn’t). Thanks for pointing me to this, it’s fascinating how nature and people coexist. 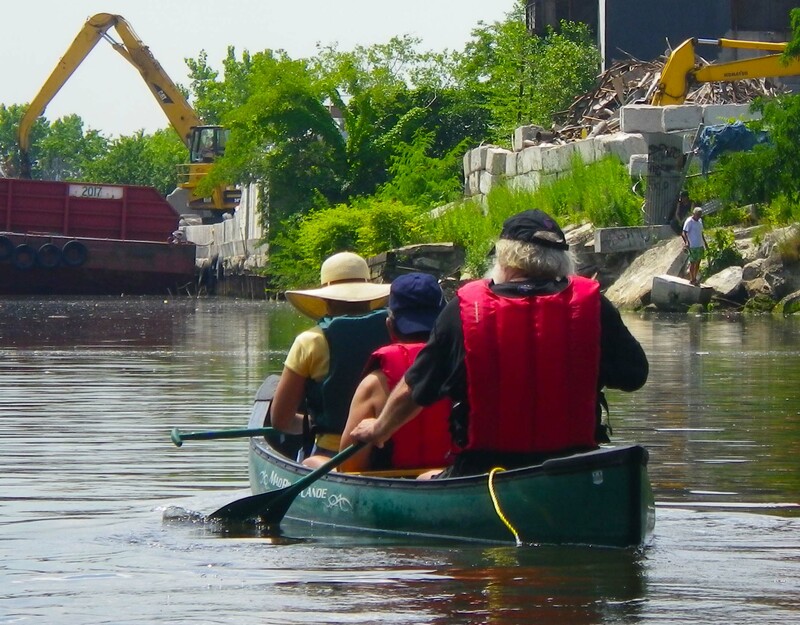 Boston made a hug effort to clean up the Charles. 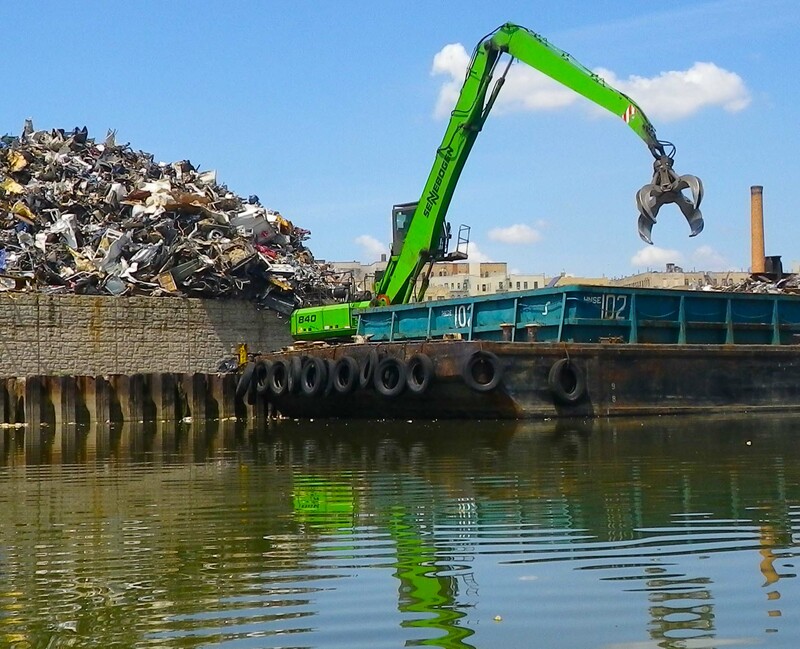 Maybe NYC will make the effort for the Bronx River one day, dredging out the trash. 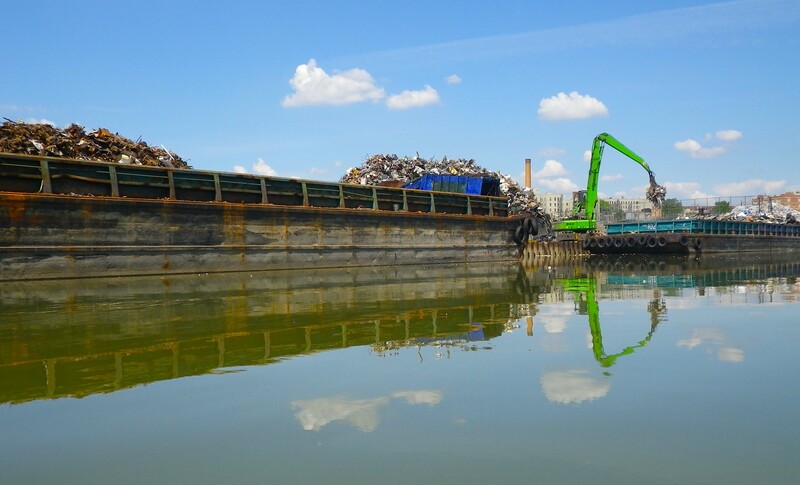 You saw the cleaner part of the Bronx River from the train (though even there, there used to be old car carcasses, shopping carts, etc.—the usual urban debris—in the river, since however mostly cleaned up, according to reports). My name is Elizabeth and I an the Sales and Marketing Associate for DESMI Inc., located in Chesapeake, VA. 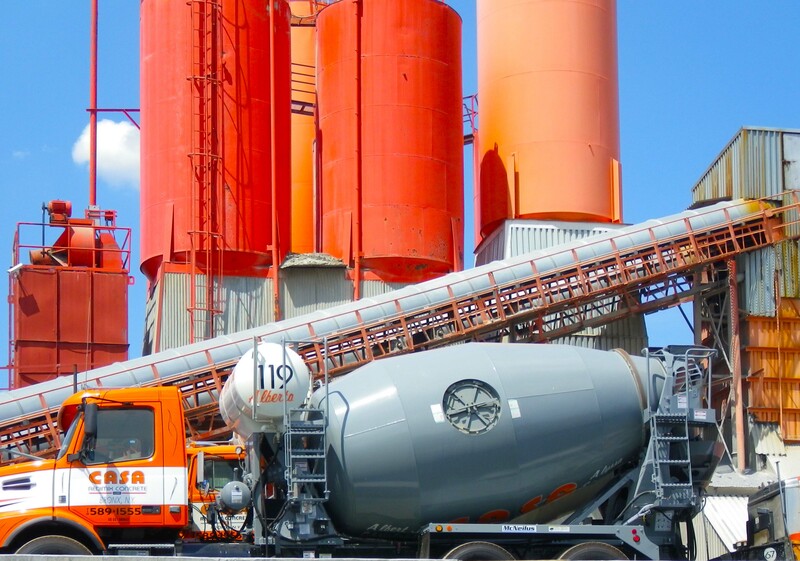 I was looking at this article and noticed that the boom pictured above is actually manufactured by DESMI!! I was wondering if I could use your photos for future promotional items?